One of the signs that settings can go beyond their original purpose, is the ability to take a world and dive into a new medium The Fae Noir setting is one such property; in addition to the RPG, Justin Bow is funding a comic on Kickstarter. Set in the world of the Fae Noir RPG, the comic is a classic post-WWI immigrant tale about a goblin and a troll… featuring the undead and the invasion of Long Island by the creatures of faery. The Fae Noir Comic Kickstarter is for the first of the Vote Early, Vote Coffin six-issue, all-original story-arc. To celebrate the Kickstarter, the Fae Noir tabletop RPG is priced at $1.00 on DriveThruRPG.com through May 31, 2017. Curious about Fae Noir and want to know more? Fae Noir is a role-playing game set in the chaotic, pivotal decade of an alternate world where creatures of mythology returned from self-imposed exile at the height of World War I. It is the Roaring 20s and everyone wants to forget the horrors of a war that spanned continents and dimensions. But the changes it wrought are not so easily dismissed. Humanity struggles to understand a world of re-awakened magic and folklore come to life. The fae, failed invaders from the lands of faery, find themselves adrift in the unfamiliar modern world, living relics of the past. It is an era of jazz and exploration, of art deco and danger; a time when the fists and courage of individuals can determine the course of history. 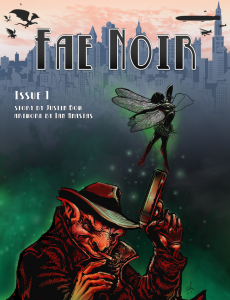 To take advantage of the game’s $1.00 price, click through to get the Fae Noir RPG on DriveThruRPG.com. To back the project and see previews of the comic, visit the Fae Noir Comic on Kickstarter.